A family friendly comedy, packed with contemporary references and easy-to-learn songs, Frida and Frosty is a performance certain to get your little ones in the festive spirit. When we first meet Frosty the snowman, on a chilly Christmas Eve, it is clear that he is in need of some help. He must gain his third black button by Christmas Day or he will melt – a prospect too awful for him to bear. Along with the assistance of Frida, a young girl who fears her prank-pulling may have landed her on Santa’s naughty list, and the audience – big and small – Frosty travels on a sing-along adventure to the North Pole. The set design is one of the winning aspects of the performance. Welcoming the audience as they arrive at The Old Sheriff Court is a colourful, Christmas grotto certain to delight and enthral the young people as they await the beginning of the show. From here, the audience is led through the building to Frida’s back garden. Snow sprinkled trees surround a large square of grass where the children are invited to sit and where we first meet Frosty. However, the arrival in the North Pole is perhaps the most aesthetically impressive part of the performance. Led by Frosty and Frida, the audience are taken into a festive, all white, Brian Cox Studio complete with mountainous peeks and icicles. The use of screen projections and prosthetic, falling snow help to further set the scene. It is here that we are introduced to many exciting, diverse characters who teach us what life is really like in the freezing North Pole. The personal, interactive input encouraged by this performance significantly differs from the traditional Christmas pantomime, which can be limiting in its audience participation due to the restraints of the raised stage. Here, the young people can embark upon the adventures alongside the characters working together to solve problems, play games and keep the snowman secret (the secret that snowmen and women can come to life). 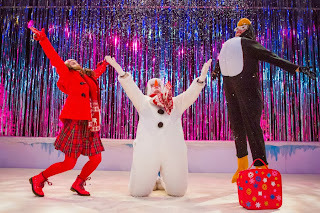 Although the colourful, festive costumes; friendly, buoyant characters and atmospheric set design are enough to attract the initial attention of the 3-7 year old audience – and their parents and guardians (the ‘Big Ones’) – it is the imagination and creativity of the young people themselves which help the performance to develop. But don’t just take my word for it: the laughter and eagerness of the young audience to contribute ideas and suggestions is a testament to the believability of the show’s characters and the engaging quality of the plot. A sure-fire festive hit for all ages not to be missed! 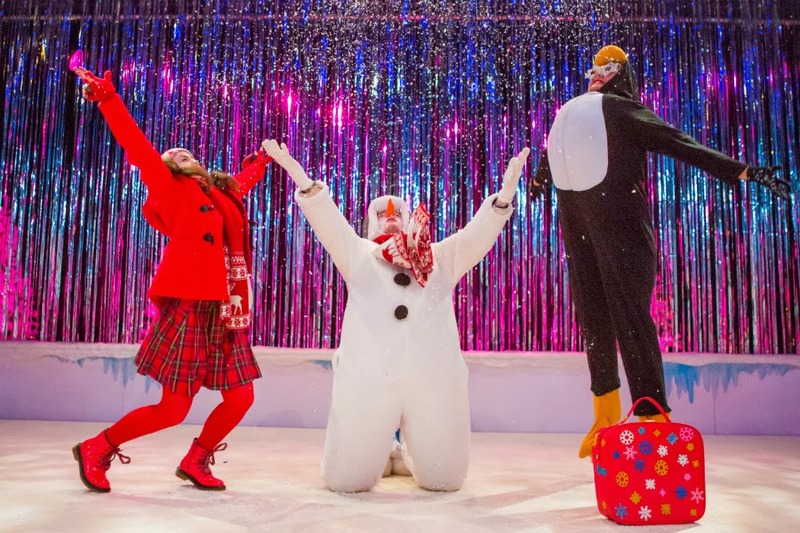 Frida and Frosty runs until 30th December 2013, various times. Tickets are £7.50 (£24 for a family of four), available online or by calling 0141 552 4267.